What if you could cook meat that tasted as good as or better than meat served at posh, cozy restaurants? Traditionally, you would have to gain years and years of practice perfecting the art of grilling, searing, pan frying, and whatever other methods chefs use to cook meat. Even then, you are not assured success. Now? Well, cooking meat to perfection has become as easy as pressing a button—literally. Popularly known as sous-vide cooking, the process of cooking vacuum sealed foods at low temperatures in a heated water bath has been used in restaurants since the early 2000s. During the past few years however, sous-vide cooking has begun to make its way into the home kitchen. 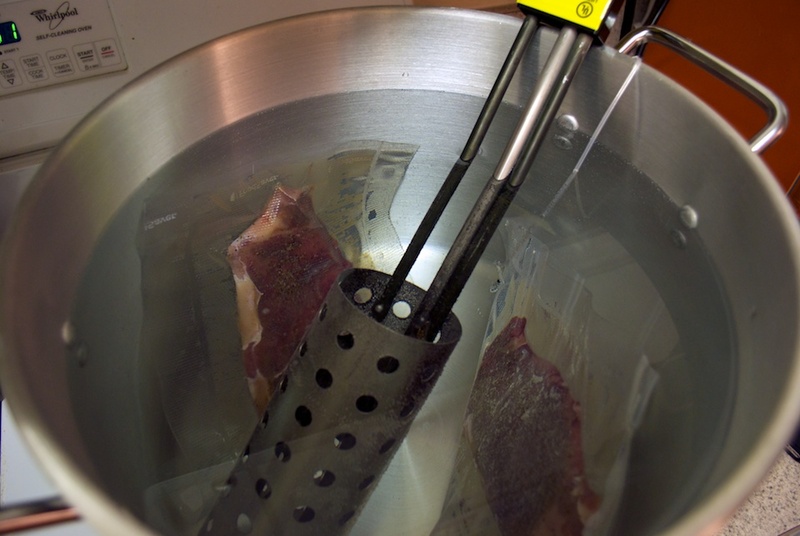 Cooking foods sous-vide works because the process offers great precision over the degree to which food will cook. 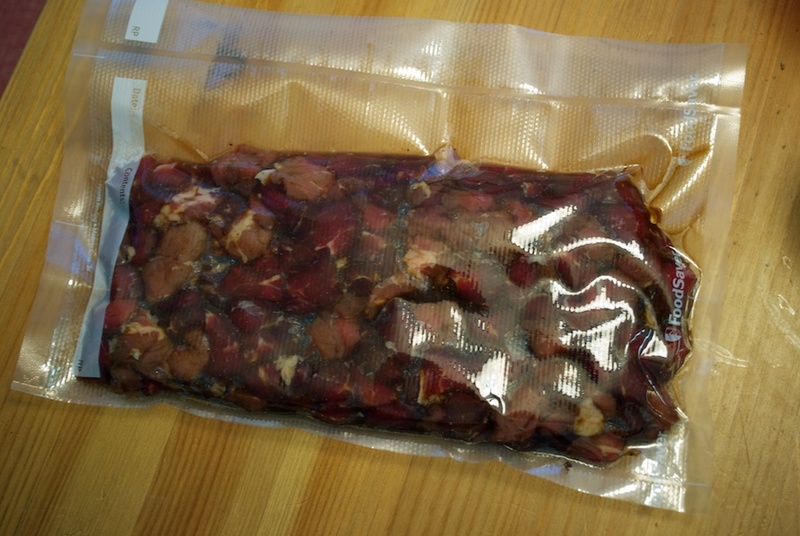 The idea is that by leaving a vacuum sealed bag of food in a water bath which is heated to a desired temperature, the food will reach precisely the desired temperature and cook no further. Familiarity with thermodynamics reveals that once the meat and the water are at the same temperature, net transfer of thermal energy ceases, so the food stops cooking. At this point, the food can be left in the water bath indefinitely until serving time. Thus, sous-vide allows the chef to precisely control the cooking of food from raw to finished. Now, you may be wondering what the big deal about cooking food to a specific temperature is, so I will tell you why. When cooking meats the traditional way, whether it be grilling, pan frying, or broiling, the meat will cook on a gradient, meaning that the outside of the meat will be cooked more than the inside. 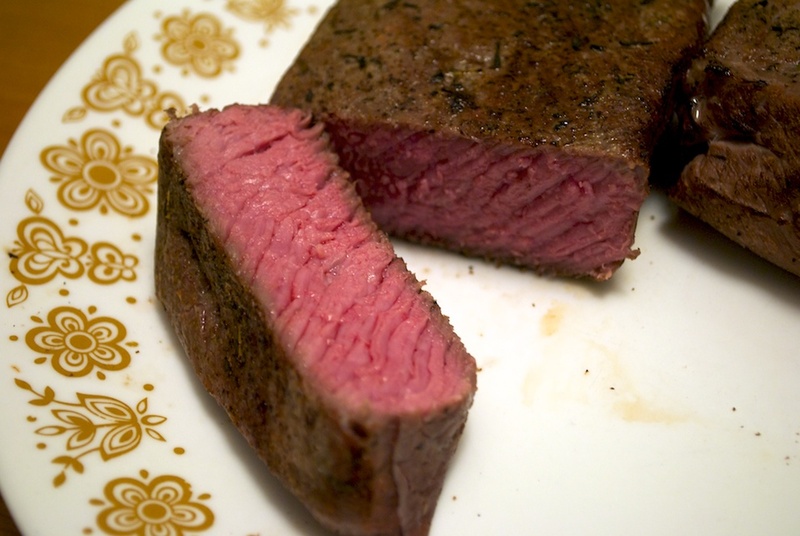 By using a 2000ºF flame, the outside of a steak may be cooked well-done when the inside is only medium-rare; in between, there might be a mix of medium-well. 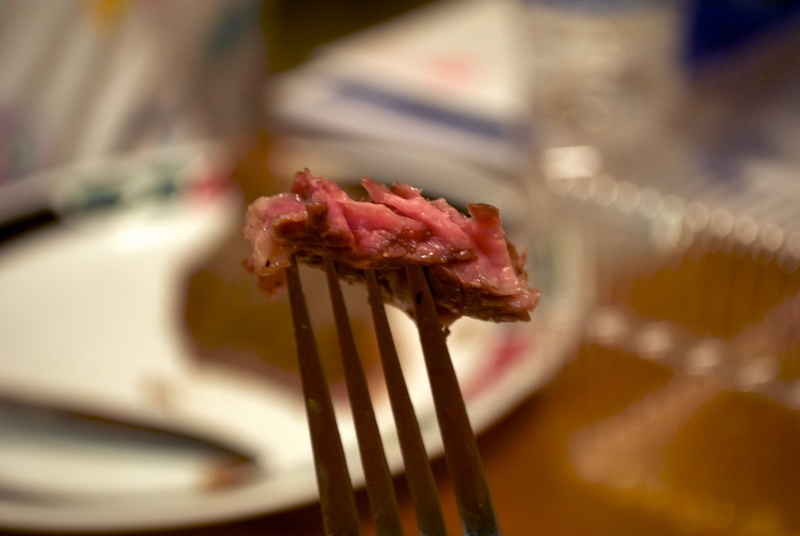 As a result, it is nearly impossible to get a perfectly cooked medium-rare steak using traditional cooking methods. Only a small fraction of the meat will be medium-rare while the rest will be medium-well or well-done. On the other hand, sous-vide cooking allows you to bring the entirety of a piece of food to the same level of doneness. 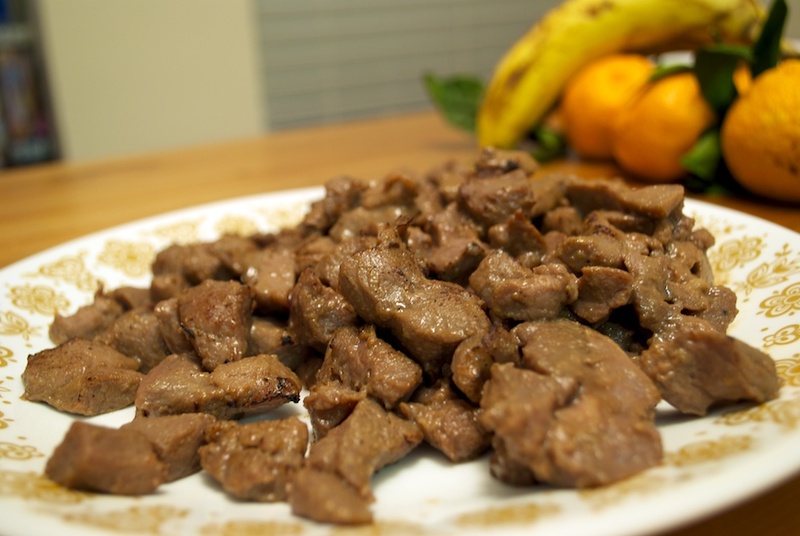 To cook something well-done, the meat must reach 170ºF, and to cook something rare, the meat must reach about 125ºF. By using a 125ºF water bath, the meat will reach a maximum of 125ºF, meaning that, eventually, the entire meat will reach 125ºF, inside and out. Thus, what you will end up with is a piece of steak that is completely juicy red. Furthermore, the vacuum sealed bag will minimize liquid loss and maximize the juiciness of the food inside. 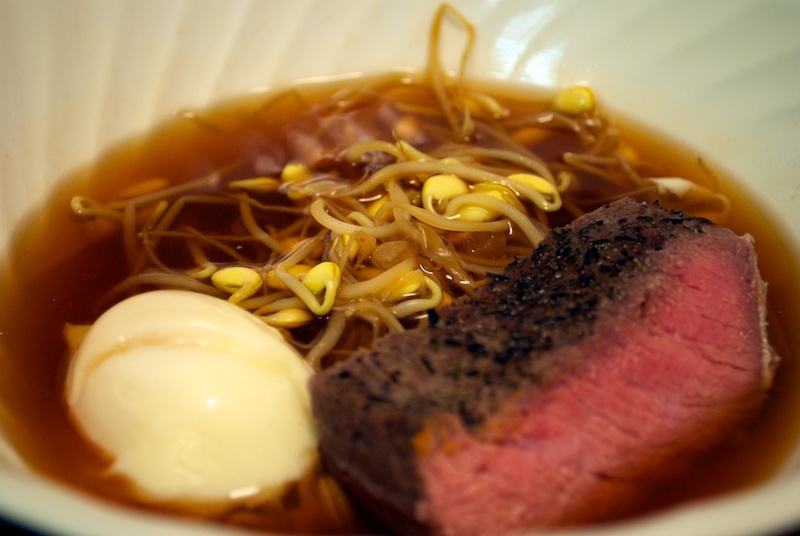 Sous-vide cooking can also be applied to cooking vegetables and eggs to a perfect, desired doneness. The possibilities are limitless, and I will expand further in future posts, but for now, let us delve into understanding the equipment necessary to cook sous-vide. Basically, in order to cook sous-vide, you need to have a vacuum sealer, like the ones sold by FoodSaver, and a constant temperature water bath. There are many ways of achieving a constant temperature water bath and mainly two types of vacuum sealers. Insulated containers with hot water and controlling stovetop flames with thermometer assistance as a method to achieve constant temperature water baths are both impractical for routine use of sous-vide cooking for obvious reasons. Sure, both are cheaper, but they are also very imprecise, and controlling a stovetop flame to keep a desired temperature eliminates the easiness of sous-vide cooking. That leaves only one option, which is an electrical heater that can automatically emit heat so that the water stays at a constant, desired temperature. Note: Thermometers may be referred to as a “thermocouple,” which is essentially a digital thermometer that measure the difference in electrical potential of two thin, parallel wires in order to gauge temperature. You do not need to know the explanation of what a thermocouple is as long as you know that a thermocouple is basically a digital thermometer. Also, the controller that varies the amount of energy sent to the heater may be referred to as PID controllers. For simplicity, I will not refer to controllers as PID controllers, but other references may. There are many different types of electrical water heater setups, but all must have a thermometer component and a controller. The thermometer allows the controller to read the temperature of the water bath and adjust the amount of energy that the heater receives in order to reach the desired temperature. Basically, the controller controls the amount of energy the heater receives from the wall electrical outlet; it is a middleman. I myself use an electrical heater with a controller, thermometer, aquarium pump, and a Foodsaver V3835 for sealing bags. While I do plan on writing a guide on creating a sous-vide setup, there are already a handful of superb resources on how to get this job done (see links below), so I’ll discuss a few other aspects of sous-vide cooking. Consider for a moment how energy travels through a sous-vide system. Energy travels from the wall outlet, through the controller, and into the electrical heater. There, the electrical energy transforms into heat energy, and since the electrical heater is submerged in water, 100% of the heat energy—and essentially the electrical energy—goes towards heating the water. The hot water then directly transfers energy into the submerged food and only loses energy through evaporation, radiation, and conduction with air. Since the water should never boil, energy loss through evaporation is minimal. Furthermore, energy loss through radiation and conduction with air is minimal, since heat is a poor conductor of heat. 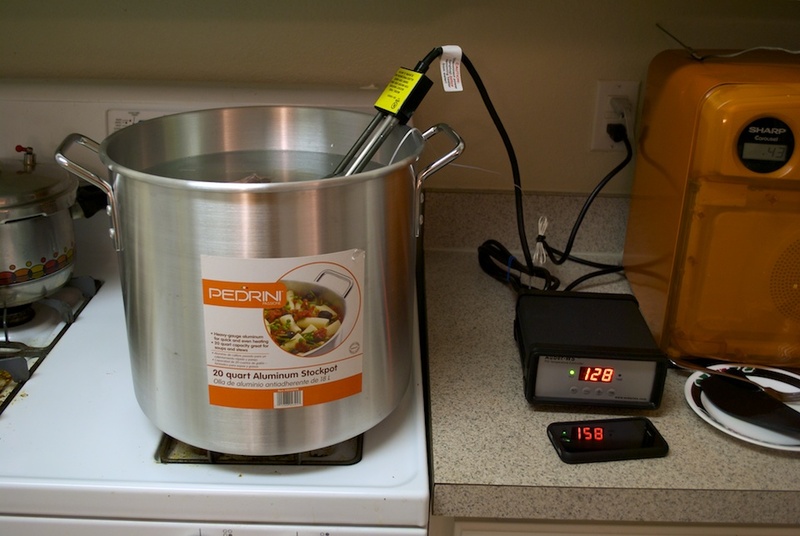 Thus, cooking foods sous-vide has the potential to be very efficient. The only caveat is that heating the water to a desired temperature in the first place requires a lot of energy. At this time, I have not done any calculations, but one could determine what the true efficiency of cooking foods sous-vide is using basic laws of physics and chemistry. 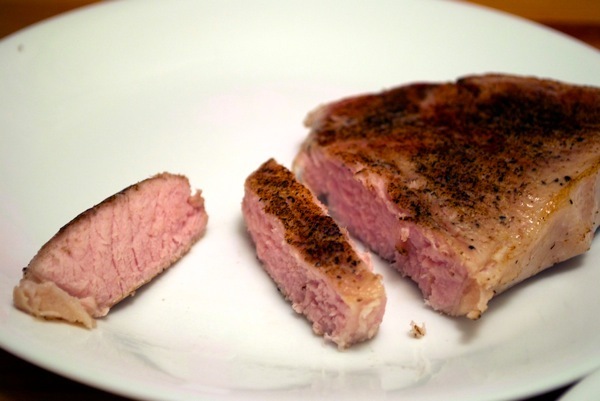 Cooking foods sous-vide is so easy. I simply drop a bag of vacuum sealed food in a water bath and forget about it. Couple hours later, I come back to a perfectly cooked meal. Sous-vide cooking requires the same amount of effort as cooking T.V. dinners do. However, cooking foods sous-vide allows one to avoid those pesky preservatives and sub-par ingredients commonly found in boxed meals. Normally, boxed meals taste horrible too, but sous-vide cooked foods do not. 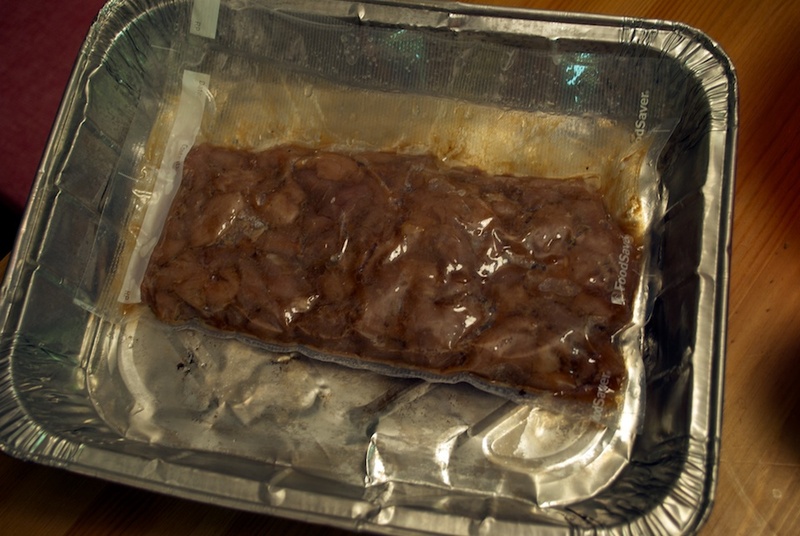 Logically, grocery stores should start selling their meats pre-vacuum sealed. This would make sous-vide cooking infinitely easier by rooming the vacuum sealing part and would help preserve the freshness of meats. Selling pre-vacuum sealed fresh foods is like T.V. dinners 2.0. Lastly, home kitchens should have built in sous-vide baths that are as common as the standard oven. 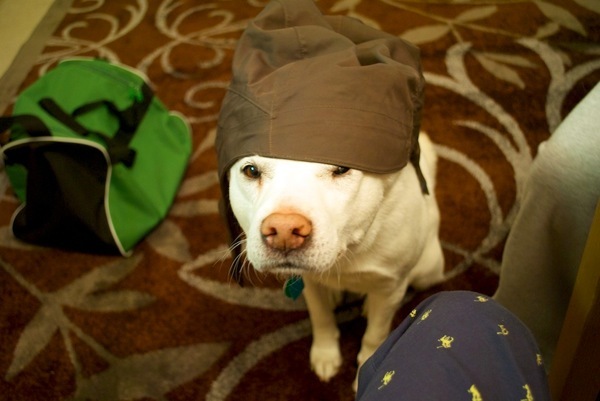 That is just a random picture of my dog.